Mark Lane Designs has become a silver member of House & Garden’s prestigious ‘The List’. Visit http://www.houseandgarden.co.uk/the-list/profile/mark-lane-designs/ With a gross brand reach of 8 million, including 170,000 Twitter followers, 83,000 Pinterest pages, Mark Lane Designs is delighted to become a member. 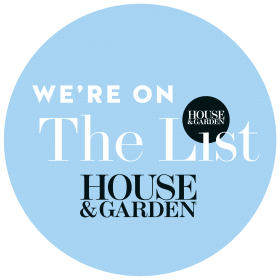 The online directory has been a great success, so House & Garden have been able to expand the reach with a printed annual edition, entitled ‘The List Directory’. Published in January with House & Garden magazine, the directory is an invaluable easy-to-use guide to interior designers, architects, garden designers and other specialists across the UK.